I think I might be nesting again or perhaps this is just my compulsion to get things done but today I attacked, REALLY attacked, the coat closet that sits just inside our front door. 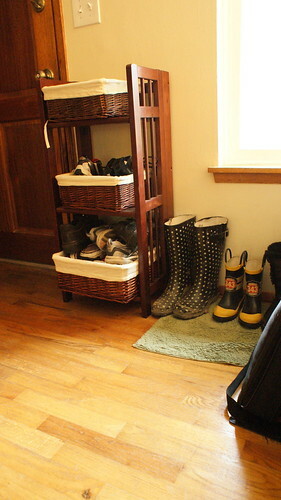 We don't have a front foyer or hallway or anything that separates the entrance from our living room so it is vital that that space functions or we don't use it. 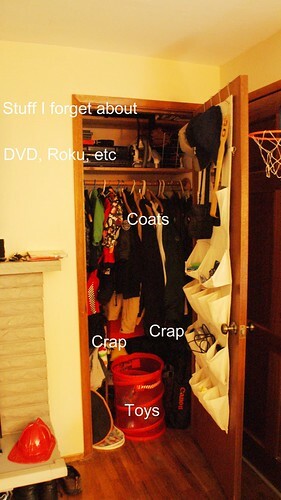 Of course, that closet door closes but I wanted to capture the full problem in one picture. 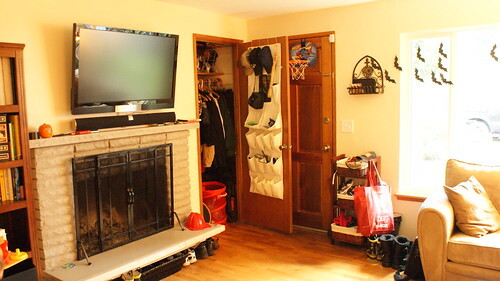 Also, our video components are on a shelf in the closet so the door has to be open for the remote to work so we do see into that closet quite a bit. 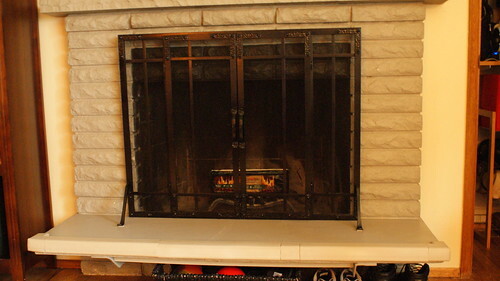 I started by pulling everything out of the closet including the lower of the 2 top shelves and the hanging bar. 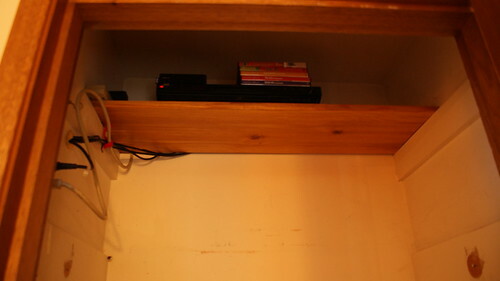 Then I moved the DVD and Roku receiver up to the very top shelf and wrangled all the cords out of the way. As I did all this, I met a few unwanted residents of the closet (8 legged variety) which I sucked into the vacuum. Then I figured out where they were coming in and I plugged the hole with some foam. While the closet was empty, I hung some adjustable shelving supports in the back. Right now I just have and need the one shelf but since needs change, I figured this was a good time to add these just in case we wanted them later. I had them on hand from my old sewing room. I'm so excited to have everything cleaned out of there. I added some hooks nice and low for Snickerdoodle to hang his favorite jackets, his hats are in a basket, our bags and some shoes are on the shelves and my yoga mat isn't being smashed by my gym bag. The hand vac is also now at kid level which I might regret but then again, it sure would be nice if the little crumb-maker could clean up after himself. It feels great to get to check that off my to do list and to know that we'll have the space needed in our coat closet for the cold weather (and gear that goes with it) ahead. 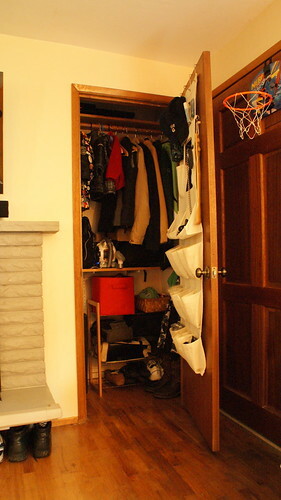 I love a clean closet--Nice work! Did you go to Hobby Lobby's opening?! Thanks Michelle. That has been on my to do list for ages so it was really nice to get it done. I didn't make it to the HL opening, I forgot actually. Maybe the boys will let me out of the house for awhile to go cruise the aisles to get familiar with the merchandise alone. I think craft stores should have little lounge areas and coffee shops like the big book store chains do. I could see myself moving into a store like that for a Saturday afternoon of dreaming, scheming and SPENDING! I have the same shelf system in my pantry and craft closet, and I have to say if I had more closets they would have it too! Your to do list MUST be shrinking! You'd think that wouldn't you? It seems for every thing I check off, I think of a handful more things to get done though. Unfortunately, not only am I trying to get some household projects done that I suspect I won't be able to tackle for awhile post-baby but I'm trying to get all my Christmas stuff done well in advance. This was a good weekend for accomplishments though.